I’ve heard guesses from African wild dog to hyena. Strangely, I’ve heard hyena a lot. I have to explain that hyenas are actually more closely related to cats than dogs (the ears are a giveaway), so that’s not possible. Not my dog. Not actually a dog at all. My dog’s shelter paperwork listed her as German shepherd mix, but she struck me as more of a pit bull mix. She had short legs and a short snout. She didn’t look German shepherd at all. I didn’t care. Then she grew and morphed into more of a boxer build with long legs, a big chest and a tiny waist, so I thought she might be pit bull and boxer, both of which would explain the brindle coat, white chest and feet. My dog is a consummate picture ruiner, so I don’t really have many pictures of her build besides this one. 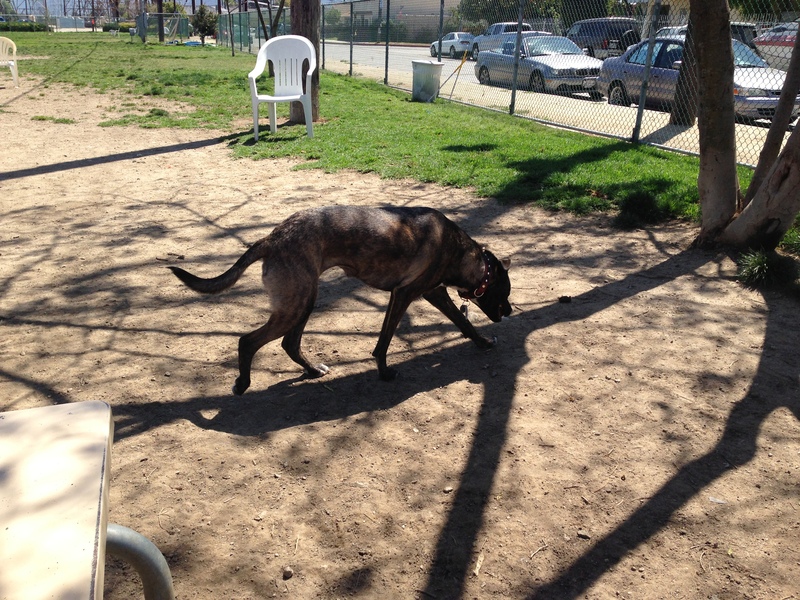 Here she is playing with her best friend and brindle doppelgänger in slow motion. My dog is the smaller, lighter-colored one. This is a perfect example of one of her many signature moves that I call The Bulldozer for obvious reasons. I have titled this bit of cinematic brilliance Cowbells & Lion Roars also for obvious reasons. No matter how much she’s built like a boxer, my dog’s face is nothing like a boxer’s (or a pit bull’s for that matter) and her fur is deceptively long. At first glance, she looks smooth coat, but her fur is actually about an inch long. You can clearly see the ruff on her neck in this picture where she’s got her head sticking out the sunroof of my car. Where did that longish fur and snout come from? Certainly not from boxer nor pit bull since they’re both smooth coat with short muzzles. Perhaps the shelter was right in calling her a German shepherd mix. For five years, it was a mystery. I heard about dog DNA testing. I waffled for a long time on getting my dog tested since I don’t really care what she is, but curiosity finally got the better of me. I ordered a kit online which included a couple of cheek swabs. I sent them in, and today, I got the results. Sorry it’s rather small on screen. Click to embiggen. The American Staffordshire terrier (a fancy name for pit bull) and German shepherd were hardly surprising, but Siberian husky? Really? What the hell? I see no husky in her at all. Companion group? She’s most likely part “luxury” breed? 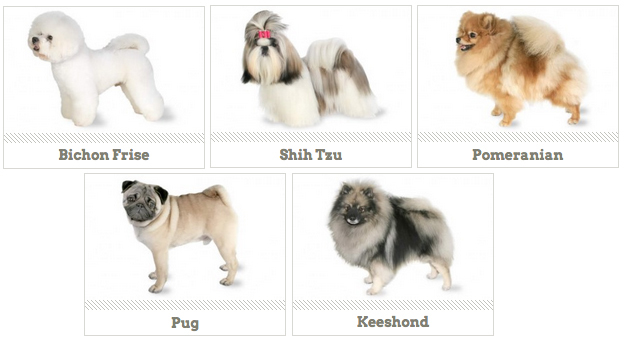 My dog doesn’t look like any of these. Though, digging into the companion group, Italian greyhound, Dalmatian and bulldog are also in there. Her body shape is sort of like a cross between a Dalmatian and a greyhound, and English bulldog is one of the breeds that make up pit bull, so maybe she is part companion group. She is stubborn like a bulldog and fast like a greyhound. Still, I’m mildly offended that they insinuated that my mutt is part toy dog. Only partly kidding. So, there we have it. I have a pit bull, German shepherd, husky, companion group mix in that order. Does it make any difference knowing this? None whatsoever. I loved her even when she was just a mystery mutt. Still, it’s interesting to see the results. I can see a bit of a lot of breeds in her (except husky–I see no husky at all). Plus, I’m happy to finally have an answer to the eternal “what breed is your dog?” question. 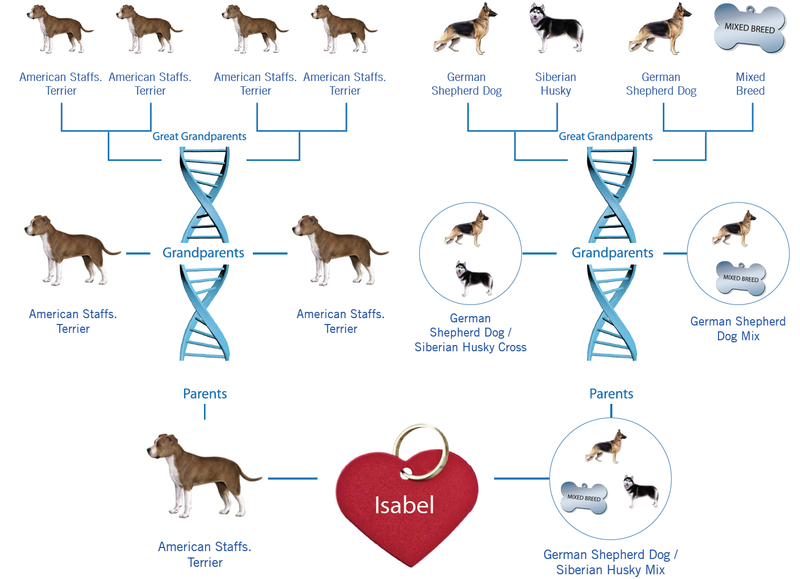 Have you gotten your dog DNA tested? How close were your results to what you thought? Posted in misc. business and tagged breeds, DNA, dog DNA testing, dogs, pets. Bookmark the permalink. Border Collies are great dogs… as long as you keep them exhausted and thoroughly entertained. I made the mistake of leaving mine home alone for several hours and he chewed a hole in the kitchen floor. You got that right! Sabu comes to the office with me, so she’s pretty much never alone. Of course, that also means that I’m almost never alone. Sigh. Did I sign up for this? Sam is your typical fancy dog…ha! Just don’t tell him that as he thinks he is a pit bull. 😉 He is a mix of Shih Tzu and Bichon. Looks more like a Shih Tzu. He only weighs about 8/9 lbs. The reason I bought him is because he stole my heart the second I saw him. He was supposed to be the husband’s dog but devoted himself to me from the second we met. 🙂 The lady I got him from was going to just take him to a shelter if I didn’t take him, so I took him. I’ve never regretted it even though he has to be groomed on a regular basis. I save my quarters just for him. He is my best buddy. As for your dog, I’m with you, I don’t see Husky, but it’s in there somewhere. And also like you….who cares what mix they are? They love us unconditionally as we love them. It’s funny how you can get a dog for one person and they end up completely bonded to another. A friend at the dog park adopted a Sheltie for her mother, but the dog is so attached to her, she ended up keeping him. I think dogs form a bond with the ones they think need them the most. They are smart that way. The dog we had before Sam was a dachsund and she was most definately the husbands. Could be. While my dog loves other humans in her world, like my sister and former roommate, she is definitely my dog. I got my dog’s DNA tested. Turns out, it’s a cat. My parents are sticklers for purebred dogs, so we always had recognizable breeds around the house when I was growing up. Of course I loved them all and wouldn’t have traded them for anything, but I’m SO looking forward to the day my husband and I are able to move somewhere pet-friendly and I can adopt some magnificent hodgepodge of doggy goodness from a shelter. One long time ago when Man = boy he grow up with beagles & dachshund. then when Man & Lady get dog it = brittany and it live in great happiness with Man & Lady 15 + 1/2 year & it break heart of Man & Lady when it croak. Little while ago Man & Lady try adopt rescue dog what = terrier mix of cuteness and good behavior. but Man develop allergy to dog dander + oils + hair since brittany and have to give it back. this make Man & Lady sad because they like dog 100 % even more than most human. this end of story of Man & dog. & Lady too. Awww. I’m sorry to hear that. One of the guys I go to the dog park with always has airedale terriers, because he’s allergic to dogs. Maybe there’s a breed out there man isn’t allergic to. Your dog is a beauty. She is one of a kind for sure. Thanks! I’m rather fond of her and mutts in general. I never understood why you’d want a dog that looks like every other dog in that breed when you could have a surprise mutt. I know! They can tell what my dog is back to her great grandparents. We are living in the future! What an interesting experience, especially to get those unexpected results. My dog is a mix of Gold Lab Retriever and Golden Retriever, and he is black as coal – the black sheep of his family. So, we know somewhere down the line there was a Black Lab in play, but now I wonder what else we could find? Fun post you did. 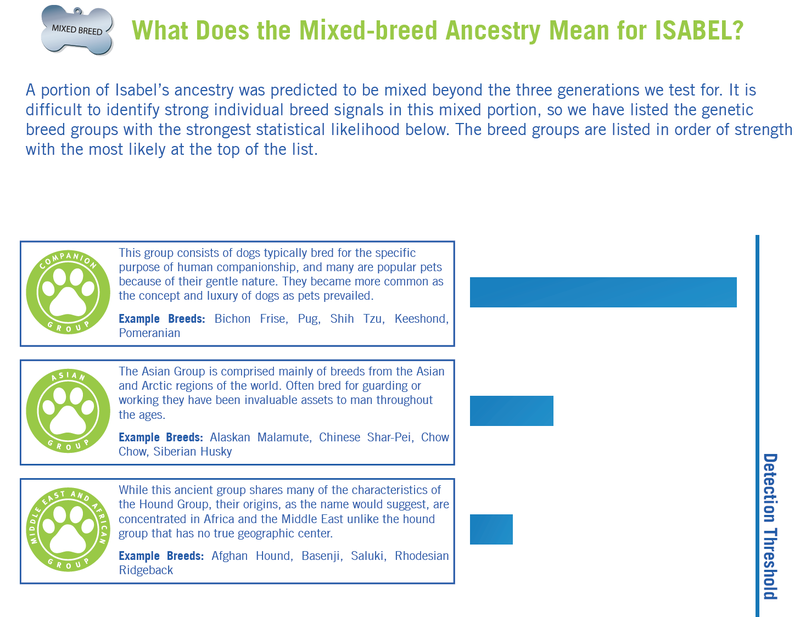 I waited a long time to do this, because it doesn’t really matter to me what breeds my dog is, but it is fascinating. If I was at all the type of person who worried about purebrededness, I wouldn’t adopt shelter mutts. Still, it is fascinating to see the results. I would love her even had she come back half insect or half zombie. My old dog was half-beagle, half-terrier. We didn’t need a DNA test since his mom was a purebred and he exhibited all kinds of terrier mannerisms and physical features. Looking like Benji was perhaps the primary one, and some crossed wires (like retrieving but not giving back thrown toys) was another. We have an Aussie mix of some kind. She was a stray my brother-in-law found on the road in Texas. Her face doesn’t match her body, and for that reason alone, I want to get her DNA tested, just to see what exactly she is. Either way, she’s adorable and we love her, no matter what she is.